In early 2011, soon after news transpired that Barnardo’s had agreed to provide ‘welfare services’ at a new immigration prison for families that the government was planning to open in Pease Pottage, near Crawley in Sussex, anti-detention campaigners – including No Borders London, Brighton No Borders, SOAS Detainee Support and others – vowed to target the children’s charity because its involvement with the U-turn scheme was seen as “legitimising the continued use of detention for children”. The first known protest against the scheme, on 7th and 8th February 2011, was dubbed ‘#Operation FirstContact‘, in which No Borders London encouraged everyone to contact consultant firm CGMS and Arora Hotels, which were at the time applying for planning permission to transform a residential school for children with behavioural and learning difficulties in Pease Pottage into an immigration detention facility for families – what would later become Cedars. This was the second attempt by Arora Hotels to extend its business into immigration detention following the company’s failure in 2010 to gain planning permission to turn one of their luxury hotels near Gatwick airport into immigration prison. On 24th March, a lively noise demo, was held outside the Mid Sussex Council District as it deliberated the planning permission. Despite the protest and the wide opposition to the scheme, however, the Planning Committee gave a green light to the continued detention of children and families and approved, by 14 votes to 1, the plan to transform the Crawley Forest School in Pease Pottage into a secure Pre-Departure Accommodation centre. Campaigners branded the decision “disgraceful” and vowed to continue the fight against the centre and the companies and organisations involved in designing and running it. The following month, on 6th April, a group of activists from groups including London No Borders, All African Women’s Group and SOAS Detainee Support swarmed into the Museum of Childhood in east London during Barnardo’s fundraising initiatives panel to ask “How charitable is it to collude with the UKBA in locking up children?” and “Why fund that of all things during the crisis?” (see a video of the action here). Later that month, on 26th April, campaigners organised a phone blockade, dubbed ‘Barnardo’s telethon’, urging people to ring Barnardo’s central and regional offices to tell “the UK’s latest prison profiteers” what they think of their involvement in immigration detention and deportation. The following day, campaigners staged a protest outside a Barnardo’s charity shop in Marylebone, London, during the busy lunch hour and leafleted customers to raise awareness among Barnardo’s customers about the charity’s “controversial involvement with the UK Border Agency.” Most customers and passers-by were surprised to hear about the charity’s new venture. The shop manager was visibly embarrassed by having campaigners outside with a banner reading ‘Barnardo’s believes in locking up children’. On 30th July, activists from Croydon, Brighton, London and elsewhere followed a call from Croydon No Borders and gathered in Hayward Heath, Sussex, to protest against the opening of the new centre. Walking through the town and distributing leaflets, the protesters drew local residents’ attention to the direct impact of European immigration policy on families in the UK. They occupied a roundabout with banners and leafleted all incoming cars, played music and engaged in discussions with passers-by (see pictures here). The demo finished outside the Mid Sussex Council offices, where planning permission was granted for the detention centre in March. The following month, on 8th August, activists from SOAS Detainee Support and No Borders London held another demonstration outside Barnardo’s HQ in Barkingside, demanding that the charity pulls out of the scheme. On 9th September, a week after the new prison named Cedars opened, activists from No Borders and No One is Illegal held a noise demonstration outside the centrein Pease Pottage. 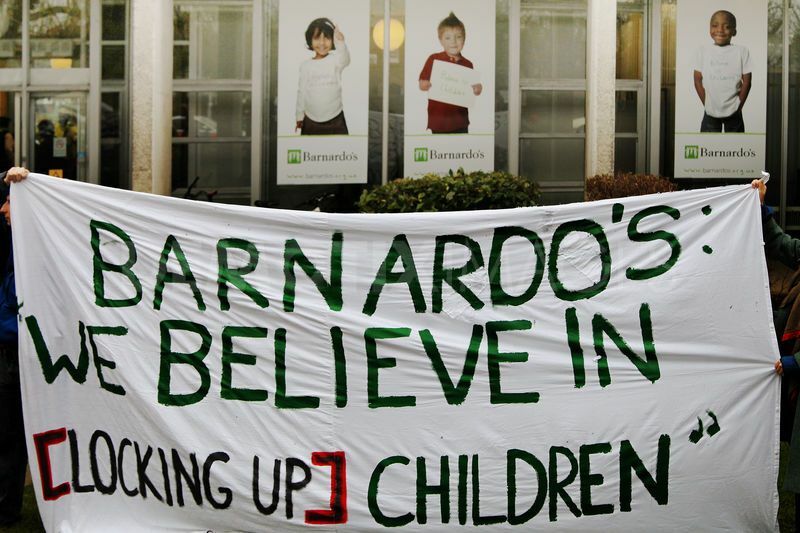 The activists gathered outside the front gates (metal fencing with a perspex cover) with a banner denouncing Barnardo’s involvement in the detention industry. They chanted through a loudspeaker and made noise with various instruments. They also walked part of the way round the perimeter fence, continuing to “remonstrate loudly against detention and deportation.” There were guards in hi-vis vests in the grounds of the centre, and a UKBA guard was also spotted. As the activists left the centre, they were stopped by police under the pretext of ‘anti-social behaviour’. On 17th February 2012, during an international No Borders Convergence at Goldsmiths university in London, dozens of activists occupied the Barnardo’s HQ for over two and a half hours, demanding that the charity “quits the child detention business”. Barnardo’s declined the protesters’ requests to speak to the chief exec and present their concerns and demands. After some time, the management said a senior staff member would meet them but then reneged on their promise and got police to violently eject the three protesters who remained inside (everyone else had agreed to go and protest outside). Shortly afterwards, Barnardo’s staff were seen leaving the building via the back exit and protestors decided to leave for today, vowing to continue their protest until Barnardo’s ends their involvement in child detention. A couple of months later, on 23rd April, two No Borders activists disrupted a prestigious fundraising concert organised by Barnardo’s to highlight its less prestigious involvement in child detention. Barnardo’s Young Supporters Concert at the Royal Albert Hall, where children from different schools take part in a mass choir, is a regular event to raise funds for Britain’s biggest children’s charity. 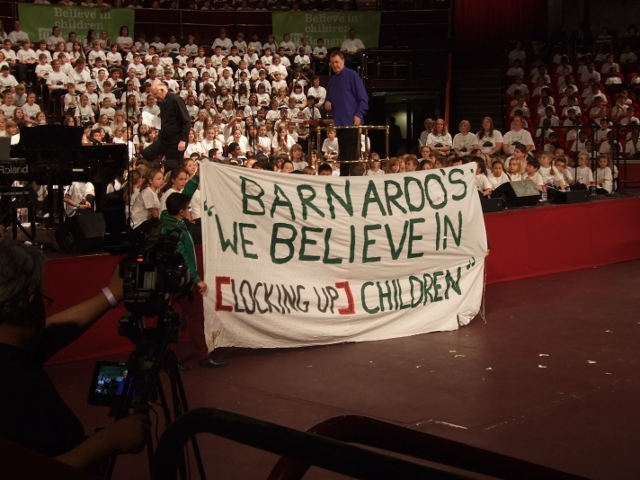 Two activists walked onto the stage and unfurled a banner reading “Barndardo’s: ‘We believe in [locking up] children’”, mocking the organisation’s slogan. 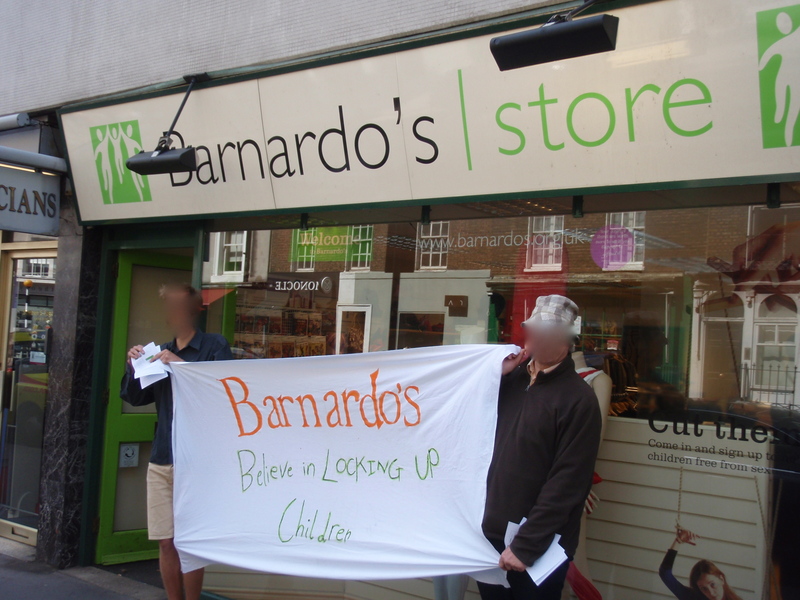 On 20th May, a group of activists paid a ‘visit’ to the Barnado’s charity shop on Cowley Road in Oxford to “challenge them about the charity’s involvement in locking up children and families.” (see video here) . On 9th June, a group of No Borders activists took banners out into the busy area of Camden, London, to ‘name and shame’ Barnardo’s. The banners, some nice art work, drew the attention of passers-by to Barnardo’s involvement in the detention of children and families at Cedars, with one banner reading ‘Children traumatised in Barnardo’s detention centre’ (see pictures here).